I devise and perform presentations about the lives of remarkable individuals. I also write and perform monologues of women of the Bible and offer humorous and informative talks, illustrated with slides, about my experience of life and acting. Titles include Maureen Lipman's Handbag; Britain's Worst Poet Laureate (in whose childhood home I grew up); The Making of Daddy's Diaries (how I adapted a rare set of war diaries into a stage play); Brushstrokes of Faith - Reading Christian Paintings; and Faith and Art. The actress Maureen Lipman commissioned me to write a play about the relationship between actresses Ruth Draper and Joyce Grenfell. 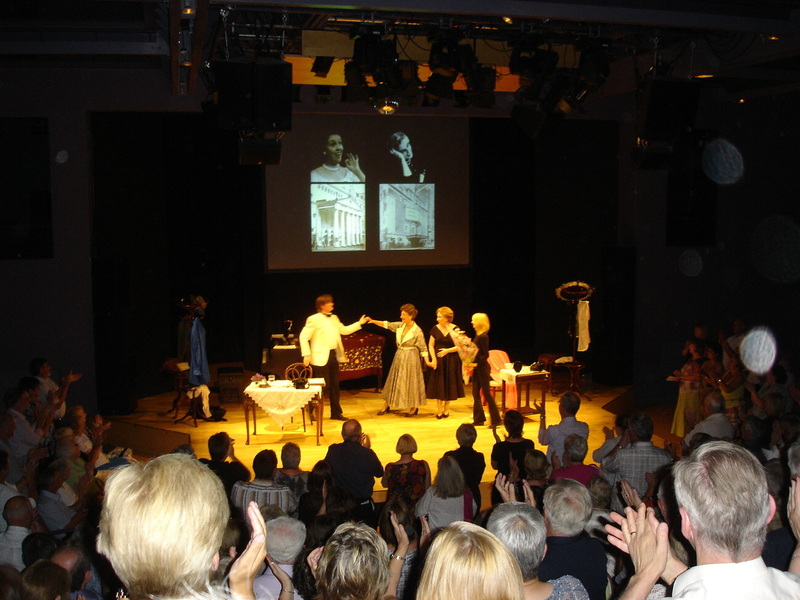 We performed the play, My Name with Yours, at the Stables Theatre, Milton Keynes (where Joyce Grenfell once performed) on July 11th 2010, to mark the centenary of Joyce’s birth. Producer Richard Price (Oklahoma!, Mamma Mia!) offered the Ruth Draper role to Meryl Streep but she obviously felt it was beyond her skills! See photos above. If ever I’m indisposed when playing Joyce I’ll send for you! May you go on keeping the flame of Joyce alive. 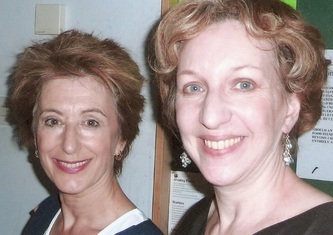 Having seen the ‘real’ Joyce, I still thought your show was absolutely excellent and delightful! My husband and I thoroughly enjoyed it..…. natural – just as Joyce did it. The concept and delivery is masterful. Integrity, talent and love run through it like Blackpool rock. I don’t often e-mail strangers but feel compelled to let you know how very impressed I was with Daddy’s Diaries. My husband and I drove 25 miles to The Stables on Sunday on the strength of having so much enjoyed My Name with Yours some years ago. We are so very glad that we did. I found myself completely wrapped up in the wonderful diaries and your sensitive and moving presentation of them. We were both entirely engaged throughout the performance and were moved by your ability to make us laugh and then switch our mood so swiftly for the many poignant moments. Your love and respect for your father allowed us to connect so fully with his experiences of wartime, of music and of love and heartbreak. We are so grateful to you for such a moving experience. I was so intensely moved, emotionally and intellectually, by Daddy’s Diaries….BRAVO (veracity) BRAVO (insight) BRAVO (technical production and technique). Len Bower – and those like him – still need to have their story told for new generations. Jane Bower’s researches stand substantially in the overall archive, and win continued respect. Simply stunning! We have been talking about it all morning so far. I had to come straight home and email you, having sat, riveted, throughout your show tonight. Everything worked - I was gripped. It was by turns funny and moving – the thread of the relationship with E was tantalising. It is something I shall not forget and I am very grateful to your father, for keeping his meticulous diaries, and to you, for bringing them to life. Your performance and the entire piece touched me on so many levels. I can't remember when I last spent time so moved by what I had seen and heard. Its historical authenticity made it the more moving. One thing that really came across was Len’s vitality: one thing which did not come across was shallow patriotism. I noticed no hatred of Germans, even when his friends were killed. You chose to use his innocent language for our amusement and light relief, and that certainly worked in the piece overall. I went home thinking, "I will never think of the war generation in a lump again; each person's experience of the war was unique." Your Doctors and Diets was masterly. I should have known from the quality of your writing that your acting would be as good. Drama is the best therapy I know and talent is always thrilling. Bravo. I was hugely pleased at the reaction on Sunday and you are to be warmly congratulated on the way you played Ruth alongside one of our great comediennes. I thought you did a brilliant job in putting the show together, giving the audience all the salient facts about Ruth and her way of life. The section on de Bosis was excellent and very moving. I learnt a lot about Ruth that I didn’t know…. It was amazing to see the monologues ‘on their feet’ for the first time too. The Actress was particularly brave; your mastery of the cod-Slavic was remarkable. Congratulations again for such a remarkable feat. Just a quick note to say how very much we enjoyed My Name With Yours last night. It was clearly a triumph. We alternated between laughter and tears throughout. You were a wonderful Ruth Draper and captured the essence of her stage presence brilliantly. And that comes from the two of us who saw not only Ruth Draper but many Joyce Grenfell performances. A massive well-done to you for conceiving, writing, starring-in, and getting My Name With Yours in front of an audience. I had no idea how it would go down with the audience last night and was amazed by your perspicacity! I very much enjoyed working with you and look forward to the next time! ….an intensely dramatic interpretation. The whole evening was a delight…For me – and surely for all the audience – Phoebe had come out of the shadows, and light had shone too on Paul and on the profound meaning and importance of his letter. 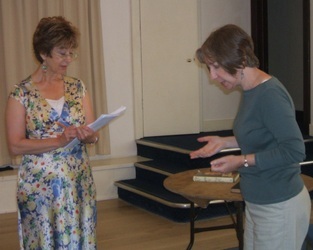 Congratulations on a mammoth effort – your technique is excellent, the line between reading and telling is often impossible to discern. Thankyou and good luck. Thank you so much for coming last Thursday for the excellent letter from Paul. It was a really good dramatisation and I have heard nothing but positive comments about it.You had a great knack of blending the humour just when Paul was getting too heavy, and making scripture, context and understanding mix together. I thought your 'A Letter from Paul' was very impressive, and helpful in understanding Romans. Your choice of phrase to make it speak to today's audience was excellent. An enormous amount of work had clearly gone into wrestling with every sentence. Beautifully done.